Campanula cochlearifolia, also known as Campanula pusilla is a mat-forming perennial native to the mountains of Europe. It is very low growing and distinguished by its production of enormous numbers of very elegant, lavender-blue bell-shaped blooms. The plant grows horizontally with rosettes of shiny green heart shaped foliage, rarely exceeding 10cm (4in) in height. Its shape is described as spreading and in the right conditions it will spread indefinitely but generally grows to around 30cm in width. Hardy to at least minus 15°C (5°F) these low maintenance beauties require moist, well drained soil and prefer light shade to full sun and can grow in nutritionally poor soil. They succeed in most situations so long as they are not both hot and dry. 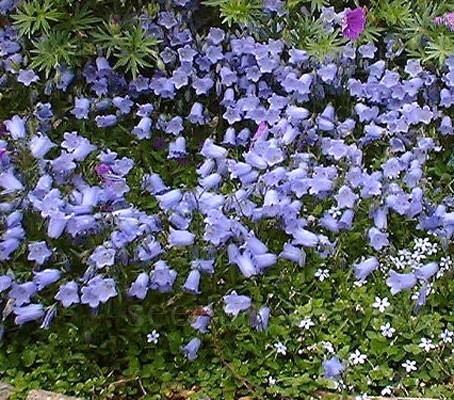 Campanula pusilla should be planted outdoors in a position bedded in gravel, in a raised bed or rock garden. It is a charming alpine garden subject and is suitable for planting in drystone walls; it does especially well on the top of walls where there are cracks for it to root into where it will develop an abundance of long lasting, nodding flowers during the summer. It has good qualities as a pot plant and can be planted out doors after having been used indoors. When planted outdoors it is not unusual that it will flower again late in the summer. 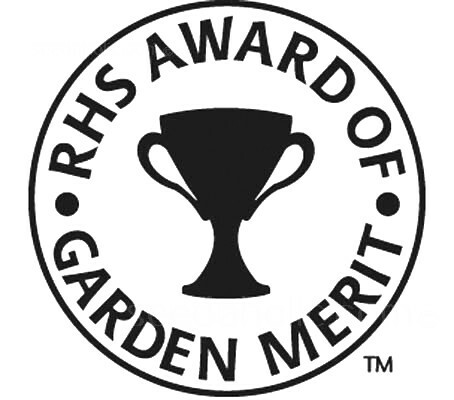 Campanula pusilla has been awarded the RHS Award of Garden Merit (AGM). The seeds should be sown as thinly as possible on the surface of the compost, press lightly into the compost but do not cover as they need light to germinate. The compost should be kept moist, but not wet at all times. Cover the seed container with a piece of glass or clear plastic and place in a cold greenhouse or cold frame. The seed usually germinates in 2 to 4 weeks but can be erratic and is occasionally over several months. Once some of the seeds have germinated remove the glass or plastic otherwise the seedlings may damp off. When the seedlings have their first pair of true leaves and are large enough to handle, prick the seedlings out into individual pots and grow them on in a cold frame for at least their first winter. Plant them out into their permanent positions in late spring or early summer, after the last expected frosts. Campanulas are easily grown in average, medium wet, well-drained soil in full sun to part shade. They require an average amount of water, as they do not tolerate really wet or overly dry conditions. Root zones that remain waterlogged tend to get root rot pathogens and can quickly lead to losses. Overly dry growing conditions greatly reduce quality and delay flowering. When watering is necessary, water plants thoroughly, and then allow the soil to dry slightly between waterings. During the growing season apply a balanced liquid fertiliser each month. In very hot summer climates Campanulas prefer part shade and will benefit from a summer mulch which helps keep root zone cool. Cut plants back to basal growth if foliage depreciates in summer. Divide every 3 to 4 years in the spring or autumn or when plants start to "outgrow" their space. Larger clumps can be replanted direct into their permanent positions, though it is best to pot up smaller clumps and grow them on in a cold frame until they are rooting well. Plant them out in the summer or following spring. The plants are self-fertile, and do not often hybridize and so seed can generally be relied upon to come true. Rock gardens, border fronts, path edging, Indoor plants, hanging baskets, window boxes, pots and containers. The genus name campanula is derived from the Italian campana meaning 'bell' and refers to the shape of the flowers. The word is from Late Latin around 1630's, campana, originally meant 'a metal vessel made in Campania,' the region around Naples. 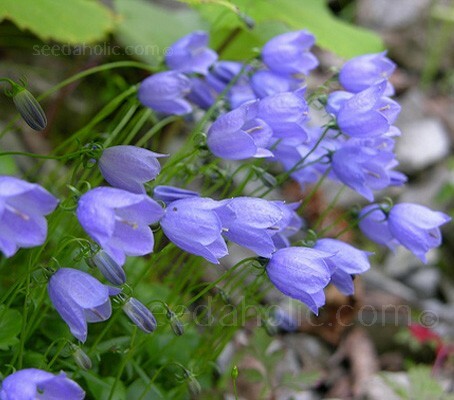 All Campanulas have bell-shaped flowers, although the flower forms vary considerably. The species name cochleariifolia is taken from the Greek kochlarion and the Latin cochlear meaning 'a spoon', from the shape of the basal leaves. The name pusilla means 'small' referring to the size of the plant. Also, the name pumila is taken from the Latin pumilio meaning 'a pygmy' or 'dwarf' referring to the diminutive size of the plant. The plant is also called Campanula bellardii, and although one might presume that, again that this is in reference to the bell shaped flowers, the name is actually after Carlo Antonio Lodovico Bellardi (1741-1826), professor of botany at the University of Turin, Italy. I can highly recommend this book as both an enjoyable read, and useful reference. 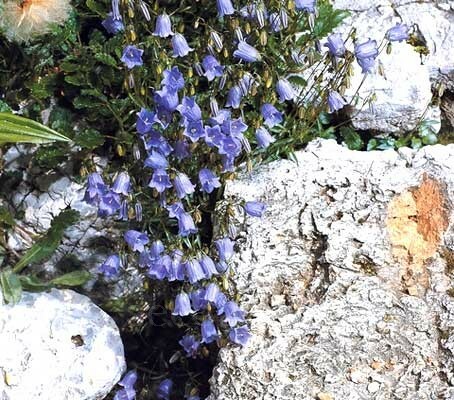 Focused on the smaller Campanula, which are discussed in comprehensive detail, at 272 pages; there is a wealth of information about a vast range of the petite bellflowers. Many specific tips are given for the culture of each type of bellflower, with recommendations for appropriate planting mixtures as well as the best propagating methods for each one. It is always a pleasure to read a book written by an expert on a topic who communicates their enthusiasm. It is also satisfying to flip through a book full of lovely pictures. Although many of these plants are not yet widely available, you are sure to find more perennials to add to your plant wish list. Prefers full sun, will grow in partial shade.